Lumis believes that the art of music is alive and thriving. Born in Minneapolis and raised in San Diego, he has been playing records since he was old enough to say "turntables." As co-founder of Sweet New Style Productions, he threw wild & crazy parties all over California (from Diego to the Bay, yo!). In 2001, Lumis felt it was time to get serious about the music game. 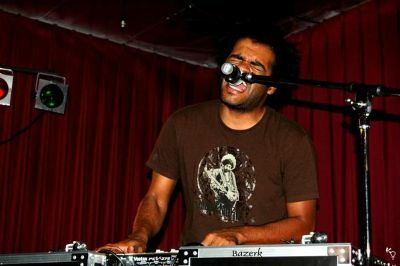 Following numerous collaborations with some of the finest up-and-coming artists in the local scene, he settled into his weekly residencies spinning records at famed Los Angeles clubs The Gig on Melrose, The Room in Hollywood, HOB Sunset Strip, and later, Floyd's Barbershop and Five Star Bar. He also co-hosted the Beat Battle at REHAB Records' MicRAPhone Fiend twice a month. In 2002, In Life We Spin was born. In early 2006, Lumis put out the mixtape CD Where the Shadows Run and remastered/re-released his 1999 mix CD A Downtempo Daydream. In late 2006, he released his first solo record, Hypothetical Questions and Rhetorical Conversations, a self-produced album of original instrumental tunes and carefully selected samples swimming in a sea of experimental trip-hop, psychedelic hip-hop, jazzy, downtempo, turntable-icious electro funk. His next instrumental project entitled 6 Miles from the Kuiper Belt was released in late 2009, the full-length vocal album Settle the Score: The Lumis LP was released in 2010, and a studio collaboration with The Smokering produced the dreamy chill-out record Audio 3 in 2011. Late 2012 saw the release of the hip-hop-heavy Green Bagz LP, followed by We Got The Juice! in 2014 by Lumis and The BeatJackers. Lumis has graced stages large and small in venues across the USA, from arenas to backyards, non-profit organization benefits to TV show wrap parties, outdoor street festivals to intimate living room gatherings. Moving seamlessly from DJ to MC, he's shared the bill with an impressive roster of artists. His additional credits include appearing in commercials for sneaker titans Timberland and Puma, battling a hand-drummer in a children's workout video, placing his songs in several motion pictures (including the films Just Another Day, The Experiment, and Snoopy Green's Vampire Movie), and acting as judge at Guitar Center's annual Spin-Off. What does the future hold for Lumis? Lots of writing & cutting & scratching & producing & editing & well, surely there are some surprises around the bend! So stay tuned.